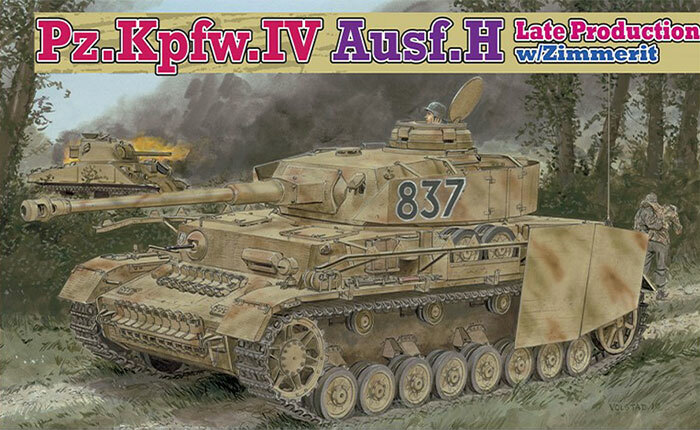 DML has now released what amounts to their 20th kit of the popular German Pzkw. IV series kits (15 previous DML releases and four cyber-hobby.com versions) since 2006. This follows up in their Pzkw. IV Ausf. H Late Production version in “Dragon Zimmerit” with a number of modified or “tweaked” parts. It also now comes with a set of DS Plastic tracks rather than a full set of “Magic Track” single link tracks (14 of those are provided for use as spares). 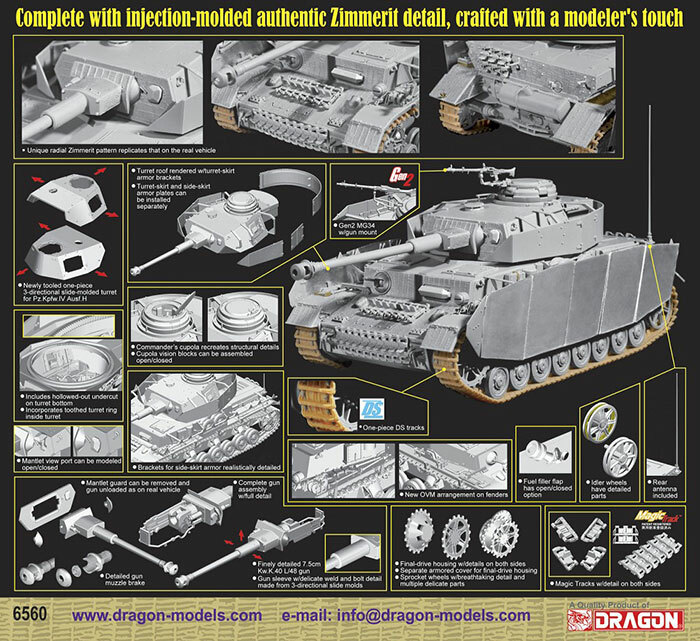 While some modelers have protested about having factory-molded zimmerit paste on German kits as they only use a single pattern, most modelers seem to like the fact they have a kit that does not require the extra time and effort to coat the hull and turret parts with the paste replica. Others are unhappy that the Panzer IV series tanks used “dead” tracks which tended to sag when worn, and the use of single track runs will not permit replication of that feature. But more modelers, again faced with less time for modeling, have commented they appreciate anything which removes tedious or messy operations from kit construction. Those modelers have a winner here as two of the most tedious tasks when building modern kits of WWII German armor - putting on “zimmerit” paste and assembling single link tracks – are now gone. Construction follows the previous kits. As with the earlier kits this kit has a hull pan which is complete less the stern plates, separate final drives, and much of the surface detail simulates screw or bolt holes; it also has an applique lower glacis plate. Drivers now consist of only four parts; the separate bolts are gone. Bogies are now nine piece affairs without separate tires. New details are provided for the tow hook at the rear of the hull as well. The upper hull again consists of a deck and framework with applique sides, front and rear engine intake components and fenders. Note that the upper hull parts (E21, E28 and new rear plate T2) need to have holes drilled in them in Step 9 but the directions note that these are optional. The muffler has a central tube section and six add-on parts to complete it along with a “slide molded” exhaust pipe. This kit also includes the auxiliary air cleaners which mounted on the right fender with a choice of two different styles of casings. All ports and hatches are separate parts so they can be posed open. While no interior components for the lower hull are yet present, the hull still provides a rudimentary firewall for the engine compartment, and the various vents and louvers are also posable either open or closed. The bow also comes with a well-done machine gun and ball mount. Note that all ports have clear styrene inserts as well. The turret is relatively conventional in its parts breakdown, but the KwK 40 is unique. The barrel is nearly complete in regard to length, being trapped between the recoil cylinders at the rear and slid through the armored recoil cover and barrel jacket before having the muzzle brake installed; this is only in styrene, but a metal part could be provided later in an upgrade set. The new commander’s cupola now consists of 22 parts and also the rail is provided for the AA MG-34 machine gun. Other than the gun and cupola there is still only a minimal interior for the turret, however. Etched brass is kept to a minimum and only covers items such as the engine air intake louvers, the inner guides of the idler wheels, some small brackets, and the flaps for the engine air intakes on the sides of the rear deck. The zimmerit parts include the front glacis sections, fender tips, rear plates, turret face and gun recoil housing, and other exposed sub-components such as castings and hatches. Technical assistance was provided by Notger Schlegtendal, Tom Cockle and Gary Edmundson. Cover artwork is by Ron Volstad (who now appears to have moved on to other projects). As these tanks were widely used, eight finishing options are provided along with a good-sized targeted set of Cartograf decals: “Hitlerjuengen” SS Division, Normandy 1944 (tricolor with crosses, black 615); “Hitlerjuengen” SS Division, Normandy 1944 (tricolor with crosses, black 635); “Hitlerjuengen” SS Division, Normandy 1944 (tricolor with crosses, black 618); 8./Pz.Rgt. 3, 2nd Panzer Division, Normandy 1944 (tricolor with crosses, white 821); Panzerlehr Regiment 130, Normandy 1944 (tricolor with no shields, crosses, white 634); 20th Panzer Division, 1943 (tricolor with crosses, black 434); 20th Panzer Division, 1943 (whitewash with crosses, black 421); Unidentified Unit (whitewash with crosses, black 401). In summary, this should be popular with intermediate modelers and those short on time.